In the proper work environment, methylene chloride paint removers are excellent products for stripping nearly any coating from a variety of substrates. When used under the recommended conditions, they work very quickly, minimizing the possible adverse effects of human exposure. They are nonflammable, so there is no risk of fire. However, methylene chloride paint remover should not be used in enclosed spaces such as bathrooms, basements, or in any area with poor ventilation. If used in such areas, the methylene chloride can pose a significant risk of injury or death due to inadequate circulation of fresh air into the work area. 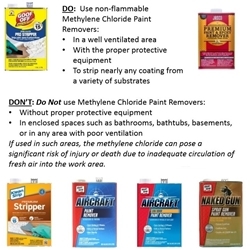 It has recently come to light that methylene chloride paint removers are being used to strip bathtubs in areas with poor and/or no ventilation; with improper personal protective equipment; or in some cases, with no personal protective equipment. This is a misuse. Stripping a bathtub is not a recommended application. The risk is magnified when it occurs in an area where there is poor ventilation, such as a bathroom or basement.